Company success is influenced largely by the existing relationship it depicts with its stakeholders (Crane and Ruebottom, 2011). The growth and diversity of the organization is influenced by this relationship and partnership, and HSBC is not an exception. Operating in more than 80 countries and territories around the world, the company success is affiliated with the relationship it has with its stakeholders. The business operating environment has two categories; internal and external. It is in these fields that the stakeholders arise. The internal environment has stakeholders that influence the daily running and operation of the organization. For HSBC, the most relevant to mention in this case are the employees. The employees are further categorized based on their roles to the organization. The range is from positions of power such as the executive managers and board of directors to the lowly employee responsible for keeping the organization and its environments tidy. Irrespective of their position, the employees are a valuable asset to an organization and influence the daily activities of the firm (Crane and Ruebottom, 2011). They are responsible for handling customers and ensuring a smooth running of the business. 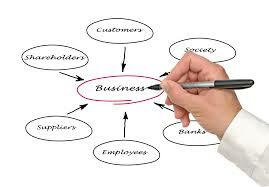 Customers are relevant stakeholders that a business engages on a regular, ongoing basis (Salado and Nilchiani, 2013). The success of the business is stipulated by the engagement of the customers and the satisfaction they receive. Therefore, HSBC success can further be attributed to the quality services they offer their clients. It is seen that customers dictate the flow of business as their satisfaction levels result into more business returns as a result of better performance. HSBC strives to offer its customers a consistent high level of quality service and experience via utilizing its geographic reach benefits and scaling towards a strong brand. Simulating market surveys and communicating directly with clients enhances understanding their needs and formulating services towards these demands. HSBC operates in different legal entities; the company engages the government as stakeholders in its activities. Negotiations are carried out to ensure mutual benefits for the legal system and the business operation. In the UAE, for example, the bank is a member of the Dubai Chamber Sustainability network as well as the Abu Dhabi Sustainability Group (Hsbc.ae, 2014). Through the acquisition of membership in these platforms, HSBC is responsible for the provision of guidance, input and sharing the best practices in the business community. The practices influence the performance of the business that the government adopts as code of conduct in the business platform. At the international level, the performance of an organization is influenced not only by the legal sector, but also by other organizations. Non-governmental organizations and non-profit organizations work closely with HSBC in an attempt of managing and sustaining operational risks (Hsbc.ae, 2014). In addition, the company has carved a niche for itself through the ability of working with local and regional NGOs in an effort of implementing community projects that are comprehensive. The result is an increase in the stakeholders as it incorporates the local and regional communities that enjoy the services of the company (Hsbc.com.au, 2014). Community representatives and charity partners work closely with the locals to understand their needs and formulate investment plans that HSBC undertakes as a partner. Lastly, suppliers are also major partakers in the cake of HSBC as they are expected to abide by the organizational code. The influence is on the running and performance of the company and since they are expected to respect the rights of the employees, they are main influencers of the performance of the business (Salado and Nilchiani, 2013). Shareholders and analysts are also responsible for influencing the performance of the business as their needs have to be complied with towards the success of the business. Since the shareholders are the main sources of funding, they have to be constantly updated on the performance of the business (Hsbc.com.au, 2014). It especially applies to shareholders with an interest in sustainable and responsible investment. Crane, A. and Ruebottom, T. (2011). Stakeholder Theory and Social Identity: Rethinking Stakeholder Identification. Journal of Business Ethics, 102(S1), pp.77-87. Hsbc.ae, (2014). Working with Stakeholders - HSBC Sustainability in the UAE. [online] Available at: http://www.hsbc.ae/1/2/about-hsbc/sustainability/working-with-our- stakeholders [Accessed 11 Nov. 2014]. Hsbc.com.au, (2014). Sustainability | HSBC Australia. [online] Available at: https://www.hsbc.com.au/1/2/about/sustainability [Accessed 11 Nov. 2014]. Salado, A. and Nilchiani, R. (2013). Contextual- and Behavioral-Centric Stakeholder Identification. Procedia Computer Science, 16, pp.908-917.